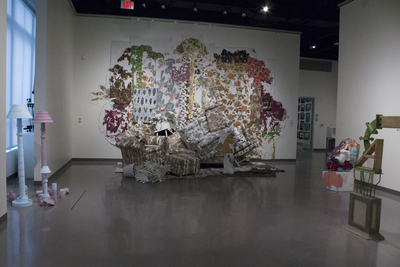 photographs of 2018 installation of "The Overgrown Garden" by artist Anna Kell as exhibited at the Spartanburg Art Museum. This recent installation foregrounds an analog between our cultural, decorative conventions and the idea of untenable growth. Though there are no actual plants here, I imagine this piece as a kind of abandoned homestead of the future over which grows an aggressive, escaped "garden" of thoroughly floral domestic cast-offs. The negative spaces of the patterns on the couches, armchairs, rugs, and textiles are all painted with matching gallery white paint, resulting in an ethereally camouflaged space that confuses the indoors with the outdoors, while also establishing a unified visual "ground" that allows better visibility of the decorative forms. Kell, Anna, "Off the Wall" (2018). Faculty Exhibitions. 18.